Are all Atari XL / XE power supplies the same? After selling our standard Atari 8 bit (65XE / 800 / 130XE / 800XL / 1200XL Computers) Composite Video Monitor cable for years (cable was manufactured 20+ years go), we recently finally Sold Out of them. Best knew mid 2016 that our local Cable manufacture could not meet our current and ever increasing demand for the very popular custom made Best 1st generation hand assembled Atari Composite Video (CV) cable for Atari 8 bit computers. So Best made the decision to make a Second Generation Improved / Upgraded custom made Atari Composite Video cable. · New 12½ Foot longer length for Atari 8 bit computers to larger Flat panel TV displays. The longer length Atari Composite Video (CV) cable gives you more set up flexibility / options, compared to the older 6 foot Atari CV cables (that tied / fixed the Atari 8 bit computer location very close to the Monitor / TV) Best has sold for the past 25+ years. · The New Best Atari 2nd Generation Composite Video cable is made with a better Higher Grade molded Video cable with a Double RF Shielded (RF suppressing Copper braid over a RF suppressing foil wrap) Coax (solid Copper Center conductor vs standard stranded copper wire used on our past Atari Composite Video cables) Video Cable for less Composite Video loss / deterioration and better Video RF Suppression. · New higher quality wire conductors on the 2nd Gen. Best CV cable have at least ½ or less than the end to end / point to point / connector pin to connector pin ohm resistance (on one 2nd Gen. CV wire conductor the resistance is 1/3) along the full cable length compared to the Best 1st Generation CV cable conductors. Which means a higher quality Video and Audio Atari signals out. · All 3 separate CV cable wires are Custom extruded into a single wire bundle for better reliability, ease of handling, ease of storage behind the Atari 8 bit computer and a cleaner cable run to the TV / Monitor / Wall mounted flat panel TV display. · Best exclusive Custom made tapered Atari 5 pin connector body (required a brand new custom mold be made) is now fully molded to the extruded 3 conductor cable body vs 1st generation Best Atari CV cable with it hand assembled 5 pin din connector body for better over all cable reliability. of a fully molded 5 pin din strain relief connector body. · Compared to the 1st Generation Best Enhanced Atari 8 bit Computer Composite Video cable, that used a plastic tie wrap installed on the cable body, to keep the extruded 3 wire bundle from separating into 3 loose wires near the end of the AV cable RCA connectors, Best installed a New Custom made (required a new custom mold) black molded on strain relief near the end of the Best Atari Composite monitor cable 3 loose wire ends. · Most of the older Atari CV cables Best has sold over the last 25+ years, averaged about 5 oz total weight. The New Enhanced beefier 2nd Generation Atari Composite Video cable weighs close to 11+ oz. · All Atari 8 bit Computers (65XE / 800 / 130XE / 800XL / 1200XL Computers) that can use an Atari Composite Video Cable, only output a single Audio out signal thru their 5 pin din Atari Composite video out female connectors. On Bests New Enhanced 2nd Generation Composite Video cable, we take the single Atari computer Audio out signal and split it (internally with the custom made 2nd Gen. CV cable assembly) into the White and Red RCA male audio out Gold Plated connectors to give you a better balanced sound out volume on your Tube TV / Monitor / Flat panel TV Display. · All three Atari Composite Video (2 Audio Red / White and 1 Video RCA male connectors) and 5 pin male connector are now fully Gold Plated for better electrical connection performance. 1st Generation Best Atari CV cable had tin plated 5 pin din male pins and tin plated connector body. hand assembled 5 pin CV cable connector. 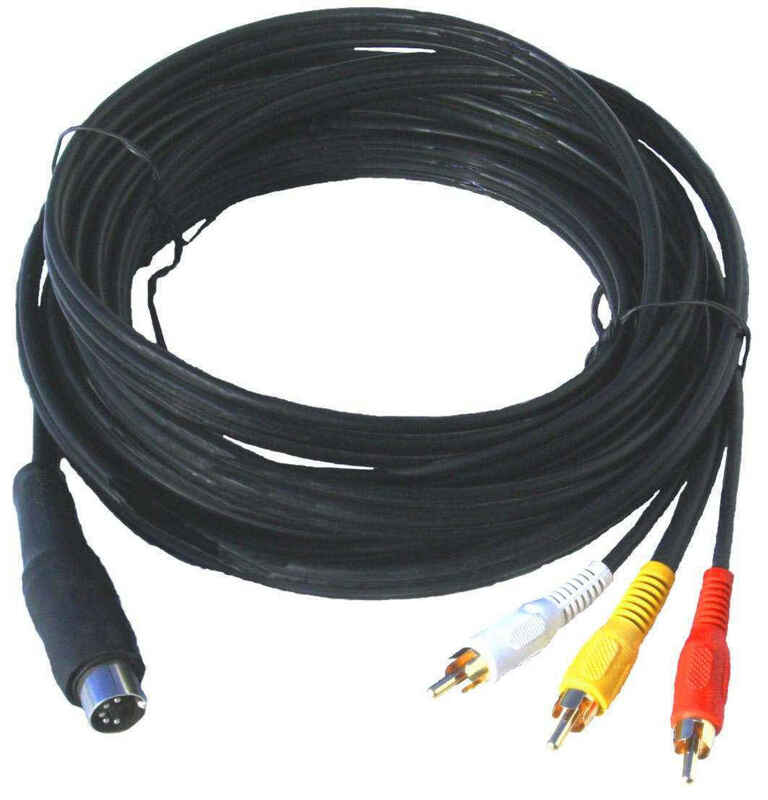 · Each new 2nd Generation Enhanced Best Atari Composite Video Cable has the Best CV cable part number and Best web site information Silk Screened on the larger center Video cable body length. 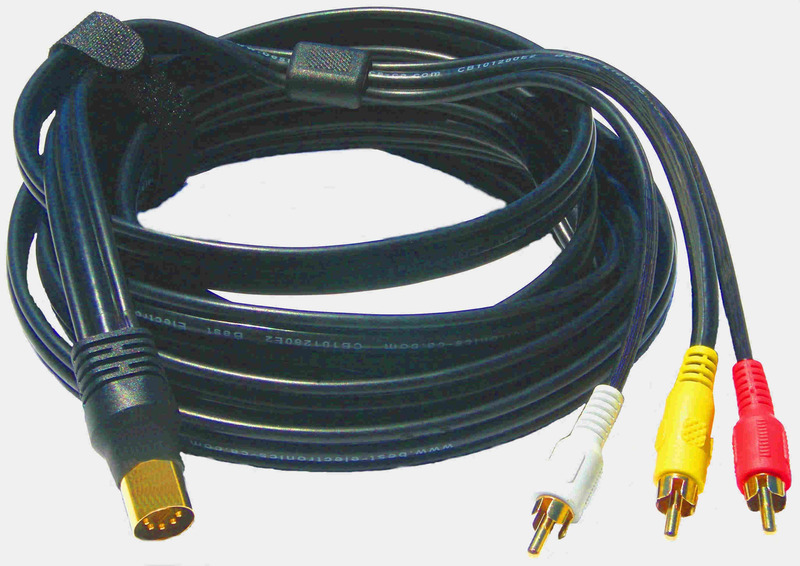 New Jaguar Combo (2 in 1) Composite and Enhanced S-Video Cable. 1. Custom made Jaguar cable. 7. Supplied with reusable black Velcro cable tie warp, to secure any length of unused Jag Combo cable. 8. Compared to the Stock made Atari Composite Monitor cable $35 and Atari S-Video Cable (sold out) separate cables from Best Electronics. Best Information Tip: The street price on the rare and very hard to find Atari made Jaguar S-Video cable only, has now risen to a new high of $50 plus shipping in a recently closed Atari E-Bay auction. James B. of MA. 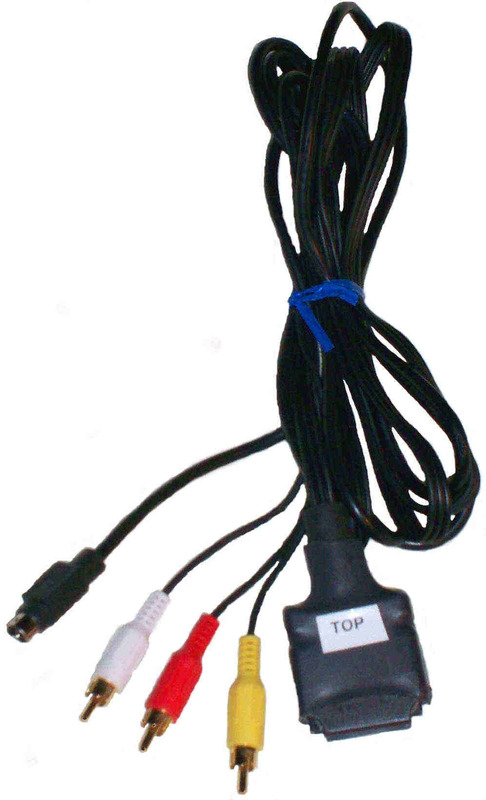 On his 1st order to Best James purchased one of Bests Jaguar Combo (S-Video and Composite Video Cables in one) video cable for his Atari Jaguar console. About to place his second Atari order with Best for one of our 2nd Gen. Upgraded New Atari 8 bit Composite Video cables. "I just wanted to add a comment that I have one of your Atari Jaguar video cables and I love it! Beautiful picture and first rate quality. I know I'll be happy with your 2nd Generation Composite Video Cable." 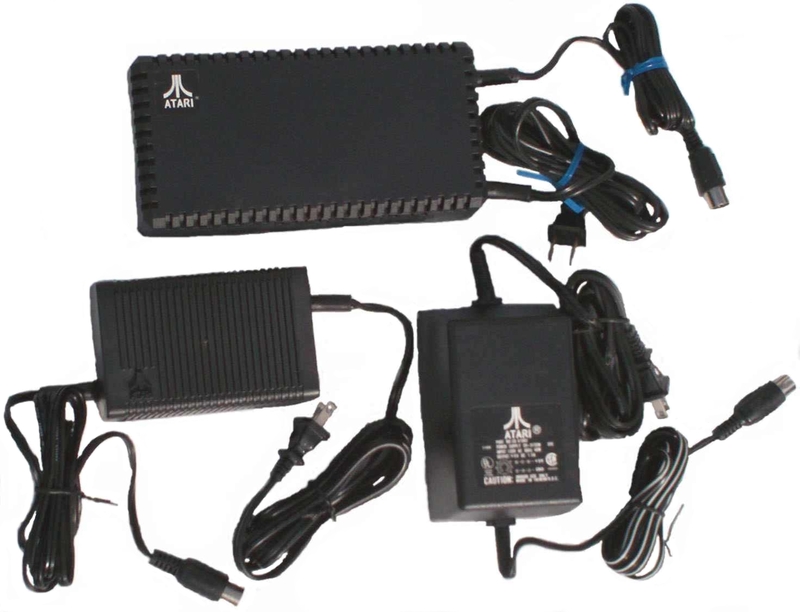 Best Atari Information tip: Atari Power Supplies or what you should know before you buy a used Atari Power supply or used Atari product with an used internal Atari Power Supply. Atari power supplies come in two basic styles. 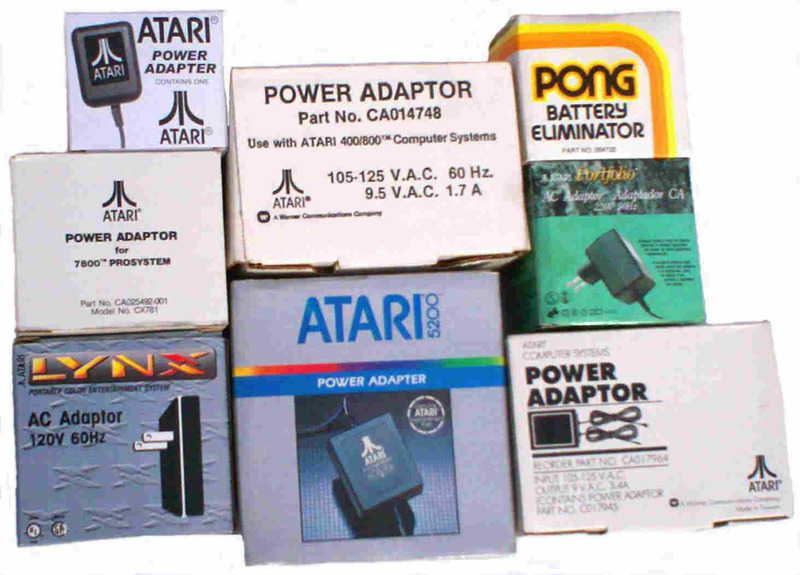 Alternating Current (AC) or Direct Current (DC) models for the different Atari Models / Products. Within the DC versions there are two basic types, Bridge rectified single voltage (single DC output voltage) or Bridge rectified Switching voltage power supplies (commonly called Switchers) with several different DC outputs with positive (typical + 5 and +12 volts) and negative (-5, -12) voltages. An Atari AC US external Power Supply is basically a 110V AC step down transformer to a fixed AC lower output voltage. Typically they have very few internal components that go bad or wear out with years of use. Usually the only things that do cause them to go bad are Power surges (like lightning strikes to power poles) that cause an internal fuse to pop open or damage (short open) the main internal step down transformer. Also an internal problem like a dead short within your Atari game system or product can cause your Atari AC or DC power supply to over heat and burn out. So if you buy a used working Atari OEM AC Power supply on E-Bay you have a good chance it will work for years. Both Atari AC and DC external Power supplies can also stop working if the input or output cables are over flexed, pulled on, crushed and the internal copper wires break. Typically this usually happens on the thinner output wires on External Atari power supplies where the wire goes into the Power supply Atari product male or female connector that connects to the Atari product or as the same thinner wire exits the external Atari Power Supply body. On Atari DC power supplies (external and Internal) have more internal components in their construction. A step down internal transformer, coils, many electrolytic capacitors, fuses, 4 diodes or a bridge rectifier, power resistors and other Semiconductor components that all have a fixed engineered component life expectancy / cycle and will only deteriorate with internal heat within the Power supply case, hours used and age. The longer a DC Atari Power supply is used, the chances one or more of the many internal components will start to go bad / fail and cause the Atari DC power supply to fail increase with total time / hours the DC power supply is used. So when you are done using your Atari product with a DC external Power supply, always unplug it from the wall outlet (or put it on a fused or surged protected power strip with a On / Off switch) when you are not using that Atari system. Basically you should think of an Atari external or internal DC Power supply like a new DC Battery for your car. It has a fixed useful engineered life expectancy / cycle (and the car battery Warranties reflect that fact down to the month) and with so many years of use it will eventually fail and have to be replaced. A new Atari DC Power supply will give you the same amount of years of reliable service life as the original Atari Power Supply did. But used Atari DC Power supplies are basically just a gamble. Would you put a used unknown used Car Battery with no history in your car and expect it to last 5 to 7 years like a new one? When you buy a used working DC Atari Power Supply on E-Bay, you have no idea if that used Atari DC Power supply has had very little use or has been used for 8 to 15+ years and the internal components that are about to fail or way past there engineered life expectancy. There is basically no easy way to test or tell from the outside of the used working DC external sealed Atari Power Supply how old it is or how many years / hours it has been used. That explains why a lot of used Atari E-Bay Power Supplies, ST Monitors, ST and 8 bit Computers and Game systems never seem to last as long as your new original Atari product did. Be aware a lot of new Atari Power Supplies (2600, 7800 and other Atari models) listed on E-Bay as Atari Power Supplies are not Atari made Power Supplies but third party made generic Power Supplies that may work on Atari products. These third party made generic Power supplies may or may not have all of the features that an Atari made OEM Power supplies have, like a longer power cord or the exact Atari Engineering specified Electrical Specifications. You can usually tell these so called fake Atari listed replacement Power Supplies by the label on the Power supply itself. If you can not see the Atari Logo and Atari Name on the Power supply label in the E-Bay auction picture, it is not an Atari made OEM Power Supply. Many E-Bay sellers either show you the back side (opposite of the label) of the generic power supply or in some cases they Photo shop out (look for a rectangular black strip) the Generic brand name off the Power supply label in the picture. On used Atari ST Monitors, 520ST / 1040ST, Mega ST, 1040STE, MegaSTE, TT and Falcon computers (all have an internal switching DC Power supplies). One of the common comments we get back from E-bay Atari buyers who are looking for an Atari replacement power supply is, the E-Bay seller said the used Atari product or Power Supply I won was tested and working fine before it was listed on E-Bay, but when I got the used Atari product or Power Supply, it worked fine for about 1 to 8 months or so and just one day died (the old DC Internal Power Supplied failed) on me. So always read the fine print in the E-bay listings and check to see if they have a Warranty (return within 3 to 30 days, buyer payer pays return shipping) or the more common No Returns accepted. 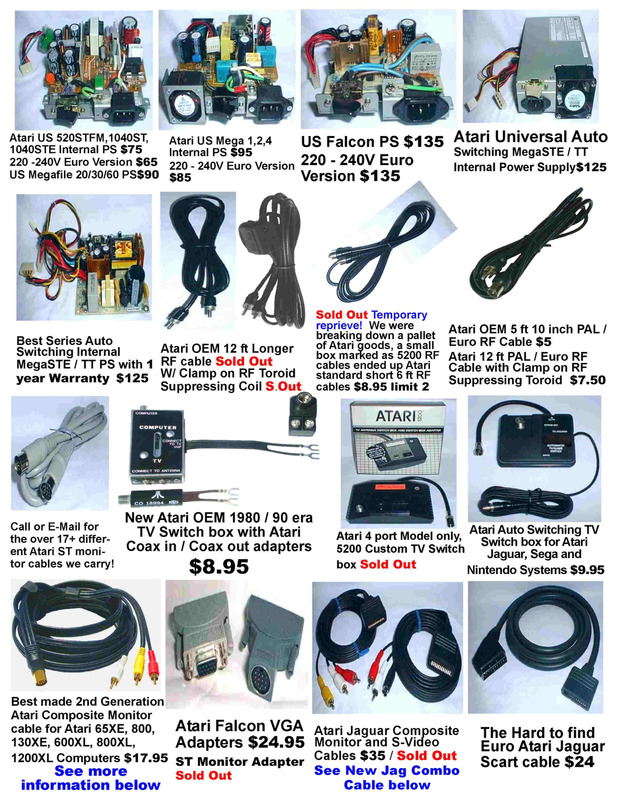 After bring in the Atari Business for over 35 years, when Best Electronics reconditions an Atari product, we know what to automatically replace (with new Atari parts) on our reconditioned Atari products we sell to give you the same product performance as a new Atari product. That is why all our Atari reconditioned products we sell have the same original Atari Warranty as new Atari products did. Most of these Generic Power supplies will work on Atari products but may not have the same features as an Atari OEM Power supply. For example most of the generic new Atari 2600 power supplies on E-Bay have short power cords, between 4 to 6 feet long. This means your Atari 2600 console and its controllers must be near a wall 110V socket. All Atari OEM made 2600 Power Supplies have always had 10 to 12 foot power cords. One of the normal Atari made Power supplies features you would not normally think about. Best Atari XL / XE Power Supply information tip. Are all Atari XL / XE replacement power supplies the same? Best Electronics classes it’s new US Atari XL / XE US Power Supplies we have in stock into two categories. The Repairable / Rebuild able Atari XL / XE version and XL / XE boat anchors versions (when these ones fail all they are good for is hanging over the side of boat). You can basically tell the difference between then by the weight and type of construction of the Atari XL / XE Power Supply. The Boat anchor version of the Atari US XL / XE Power supplies are very heavy and have no way they can be easily take the cases apart. The cases are usually ultra sonically welded or epoxied together. The reason why they are very heavy is, on the inside of these XL / XE Power supply cases are filled with an Epoxy filler. It seems when these Atari XL / XE Power supplies were made, it was industry standard for Power Supply manufactures to fill all of their external Power Supplies (of that era) with epoxy. Our best guess why they did this, it was a way to keep other manufactures from seeing their company internal power supply circuit designs. Also it was suppose to help dissipate the heat off the internal Power Supply components to give them longer serviceable life in theory. But in real fact, the Epoxy filled Atari XL / XE Power Supplies all will fail prematurely. 20 / 20 hind site, it was found that the Epoxy actually held the heat against the internal components of the Atari XL / XE Power supplied and caused them to fail way under their specified normal engineered life cycle. Any Atari owner of one of these Epoxy filled Atari XL / XE Power supplies will tell you the exact same story when their Epoxy filled Atari XL / XE power supplied failed. I was using my Atari XL / XE computer one day and the TV screen went black and the TV Speaker started to make a very loud 60 cycle buzzing / humming sound or I was using my Atari XL / XE computer and the TV screen display started to get rolling bars across the TV Screen display with very load buzzing sound. Soon after that, the TV screen went totally black with only the load Buzzing sound left. The Epoxy filled Atari XL / XE Power supplies when they fail, have a greater chance of also damaging / destroying the Atari XL / XE internal motherboards. Top Atari Power supply is one of the Repairable / Rebuild able Atari long length XL / XE US Power supplies Best Electronics has in stock. Below is just 2 of many different Epoxy filled Atari XL / XE Power supply versions that show up on E-Bay. The Repairable / Rebuild able Atari XL / XE Power supplies for starters, have a hollow internal construction / case. There are even two different versions of these Atari Power Supplies. The one version has a black top and bottom XL /XE Power supply plastic cases that are ultra sonically welded together / closed / sealed. The only way to get into one of these version Repairable XL / XE Power Supplies is to break open the black plastic case. The other Repairable / Rebuild able Atari XL / XE Power supply Best Electronics considers one of the best XL / XE Atari ever made, has four removable rubber feet on the bottom of the power supply with a Phillip case screw under each rubber foot. After years and years of good reliable service, you can easily take apart one of these Repairable / Rebuild able Atari XL / XE Power supply, to easily replace a blown fuse, replace electrolytic capacitors or other power supply components. Also the non-potted hollow Repairable / Rebuild able Atari XL / XE Power supplies run cooler internally, which also helps to extend the usefully life of the internal DC Power Supply components. XL/XE Power Supply AC Adapter 1.5A Tested Atari. More than 10 available 65 sold Sold on E-bay 08-20-18 for $12.00 plus $15.65 shipping At least 50+% of all old Atari XL / XE Owners know about these Atari brick (epoxy filled) XL / XE power supplies and would never buy one at any price! They are all ticking time booms, not if they fail, but when they due fail, there is a very good chance they will damage / destroy your Atari XL / XE Computer !! Bests New Atari Rebuildable XL / XE US Power Supply with normal 90 day Atari Warranty. $27.00 plus shipping. Although Best Electronics has pallets (4 by 4 by 4 foot high, by thousands of pounds per pallet) of the New Epoxy filled XL / XE power supplies in stock, that came out of the local Sunnyvale Atari parts warehouses. Best Electronics prefers to only sell the rare (do not get a lot of them from Atari) US repairable version XL / XE DC Power Supplies. Best Electronics also has a small supply of the even harder to find Repairable / Rebuild able New Atari 400 / 800 / 810 / 822 / 850 / 1050 / 1200XL / XF551 50 watt AC universal Power Supplies in stock. Again under each rubber foot is a case screw. Because of the big volume of Spam E-Mails we receive everyday, we had to install E-Mail Spam filters on our server. When sending an E-Mail to Best, Please put the word "Atari", Atari item or Atari part number, Atari Question or Atari Sales inquiry in the Subject line. E-Mails with the typical Spam subject matter like: Urgent, Must read, Regarding, FWD, HTML Code, Blank subject line (RE:) or other SPAM E-Mail Subject lines you receive, will be automatically deleted on our E-Mail Server and never reach us. After sending your E-Mail to us, if you do not hear back from us within a day or less, please resend your E-Mail inquiry with a different Subject matter information or from a different E-Mail address. We do 100% respond to every Atari E-Mail we receive. But sometimes Spam Filters on your Internet Service Provider or your own personal E-Mail Spam software filter you have installed may delete or send our return Atari E-Mail to your Trash can.